Here, steps you can take to arm yourself against less-than-healthy impulses, and minimize the angst you feel on a daily basis. Wake up 30 minutesÂ earlier to walk before work. Swap candy for fruit when a sugar craving hits. Do 60 fly-ups during Dancing With The Stars. Healthy goals always seem so straightforwardâuntil temptation strikes and you end up hitting snooze, raiding a vending machine, or vegging out on the couch. 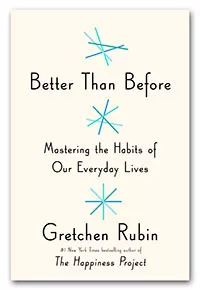 âThe fact is, weâre surrounded by temptation,â writes Gretchen Rubin in her new bestseller Better than Before: Mastering the Habits of Our Everyday Lives ($16, amazon.com). She cites a 2011Â study which estimated that we spend about a quarter of our waking time resisting some aspect of desire. But hereâs the good news: There are steps you can take to arm yourself against less-than-healthy impulses, and minimize the angst you feel on a daily basis. In her book, Rubin calls themÂ safeguards because they're designed to protect a new good habitâwhatever it may be. If Iâm writing, I shut down my email. If Iâm invited to dinner, I eat a snack before I go so I wonât be too hungry. âHow about this,â I suggested. âInstead of feeling that youâve blown the day and thinking âIâll get back on track tomorrow,â try thinking of each day as a set of four quarters: morning, midday, afternoon, evening. If you blow one quarter, you get back on track for the next quarter. Fail small. Not big." Although some people assume that strong feelings of shame help people stick to good habits, the opposite is true. People who feel less guilt and show compassion toward themselvesÂ after a slip-upÂ are better able to regain self-control, while people who feel deeply guilty struggle more. Instead of viewing your stumbles as evidence that youâre weak, see them as part of the habit-formation process. Tell yourself, âIt happens,â or, âWhat I do most days matters more than what I do once in a while.â That kind of self-encouragement is a greater safeguard than self-blame. Sometimes we want to break a habit, to take advantage of a rare opportunity, say, or to celebrate. A very effective safeguard in that situation is the planned exception, chosen very consciously, ahead of time. These exceptions work best when theyâre limited. (For example, go ahead and skip the gym so you have extra time to prepare for the annual retreatânot the weekly staff meeting.) A good test is to ask yourself how youâll feel about the exception later: Will you think, Looking back on it, I wish Iâd made a different choice? Or: Iâm so happy I took advantage of that opportunity. Adapted from Better Than Before: Mastering the Habits of Our Everyday Lives Copyright Â© 2015 by Gretchen Rubin. Published by Crown Publishers, an imprint of Penguin Random House LLC.